I am attached to my cargo bike. In Cambridge, I bought and fell in love with a bike that corners like a dream and hauls anything from babies in car seats to Christmas trees. Being prudent, I sold it to some guy from Leeds before moving to Hong Kong in 2012. 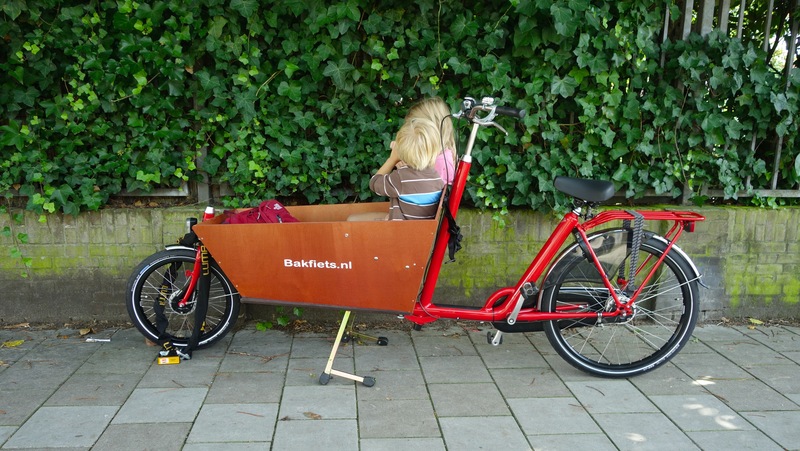 When we returned to Europe, the first thing I did in Utrecht was buy another bakfiets. I love it even more than the first time around. I barrel down the cycle paths, bullying cyclists on lesser bikes. I am so used to handling it that it is like an extension of my body. As we are moving back to Hong Kong this summer, I know I should sell my bike, but I am desperately trying to justify keeping it. So in addition to occasionally riding up and down the cycle paths ringing the Tolo Harbour (and dodging the clusters of very amateur cyclists that clog those paths), what could I use my cargo bike for? Below is my ridiculous short list. Drawback: Steep price of importing proper ingredients. Drawback: Certain death by luxury car, probably with a vanity plate reading something like “L0L” or “G0D”. Drawback: I might be requested to pedal Zwarte Piet around as well. 4. Invent new extreme sport, “cargo bike mountain surfing,” involving balancing oneself in the box part of a cargo bike while traveling down from The Peak at aggressively high speeds. Drawback: Same as point number 2. Drawback: Waste of a great bike. Bring it – especially if there are bicycle lanes! A luxury we don’t have here in Thailand! Might be worth it for the novelty value alone! You could use it as a planter! How about a mobile dim sum food cart? looks like it might float. how about replacing the rear tire with a paddlewheel? This is the best idea I’ve heard yet! Take it! You could make *insert some kind of hipster food (not necessarily tacos)* and deliver it to people’s workplaces for lunch! Well, I would say that one thing all Asian cities need is a good photo opportunity. All you have to do to justify bringing it, is hang out on the sidewalk for a few hours, fill the cart with cats in boxes or flowers if you want it to be easy (pfft) and charge for people to take pictures on your bike. There you go, problem solved! You are are so spot on! How did I not think of this one before. Now I just need to brush up on saying “no money, no photo” in both Mandarin and Cantonese. You got it! I see millions in your future! Hi I just drop by and would like to leave a message after read this post. I am born and raised in hk and has been living in NL for eight years. How do you like NL compared to HK? In a few weeks I’ll be able to ride my bakfiets around the New Territories. Should be very interesting!